Larry Heydenburg joined the Grand Rapids Camera Club in 1972.As far back as he can remember Larry had an interest in photography. His interest really took off when his sister entered him in a contest and he won a Kodak Brownie Bullet camera.He was given an Argus C-3 when he entered the service and bought his first SLR camera after his military discharge. 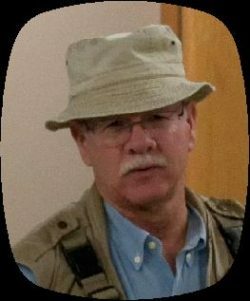 Larry joined the Grand Rapids Camera Club (GRCC) when the club was still small, the meetings were held at North Kent Mall and the workshops at members’ homes.By 1973 his photography skills and enthusiasm earned him “Photographer of the Year” for pictorial and nature slides. He was awarded the “Lucille Ryan Memorial Award” from the Southwestern Michigan Council of Camera Clubs (SWMCCC), for best portrait slide.He earned his “Star Master” award in 1988 from GRCC, and is number 2 in total merit points.He enjoys the competition, especially nature, photojournalism and portraiture.He had his photographs published in In Celebration of Grand Rapids and other publications. It did not take him long to become more involved with the workings of GRCC, he was a competition judge first and served on the board of directors for 13 years.He severed as vice-president of Programs and than club President for 4 years.Turing those years the club updated the constitution and competition standards much of which we still use today.He also started the Photojournalism division.Those were the years of working with Joe Timmer and Evelyn Zeek, who set a high standard for everyone. Larry has had the satisfying experience of working in many photography organizations through the years, serving as co-chair for the Photographic Society of America (PSA) international convention with Evelyn Zeek when it was held in Grand Rapids.He served as President for the Grand Rapids Color Slide Club, Calder City Camera Club, River City Camera Club and SWMCCC.He continues to work with the SWMCCC Summer Weekend of Photography and GRCC conducting various programs and workshops as well as working on several committees. Oh, and as a sideline to his photography Larry collects antique cameras.